Megan and I recently attended the 2nd Annual Creative Vitality Town Hall, hosted by Philadelphia’s Office of Arts, Culture and the Creative Economy (OACCE). An inspiring mix of over 250 artists and nonprofit and creative business professionals came together for an update on the city’s Creative Vitality report and the chance to brainstorm about different challenges and opportunities we’re facing in the arts community today. 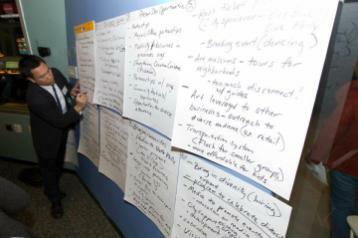 The breakout sessions were a main focus of the event. Groups divided up in the WHYY space to talk about Arts & Youth, Arts Practice/Individual Artist Issues, Diversity/Community Engagement, Creative Placemaking, Funding/Policy & Advocacy and other topics, trying to brainstorm ways to overcome barriers and make new connections. A common refrain in my Diversity and Community Engagement group was how to find new ways of reaching into different neighborhoods in Philly. The audiences are here: open, willing and ready to experience something new. So how do we make the work accessible? How do we overcome prejudices and embrace curiosity? It lead me to think of another Canary artist, Headlong Dance Theater and their latest project This Town Is A Mystery. This new piece is taking on those barriers directly by inviting Philadelphians to open their doors, welcome their neighbors into their universe and create a performance in their personal space. I brought up the project (which is still accepting applications!!) to a few artists afterwards, and the feedback was incredibly positive. People want to see more work like this: work that creates a direct and intimate connection between the artist and the audience. That makes it pretty clear that when we’re talking about our clients, one of our top priorities is showcasing this connection and making it part of the conversation. The OACCE put together a slideshow of the ideas we came up with at creativephl.org where you can also see the complete list of works that struck a chord with the crowd. Taking the time to be a part of the conversation, to really brainstorm without limits, is an invaluable part of the creative process, and definitely something I’ll be plugging into my calendar more often.